MostCreepy.com - The story about Nyi Roro Kidul is really popular in Indonesia. Nyi Roro Kidul is one of the daughters of Prabu Siliwangi (King of Sundanese) who has an ugly face due to an illness. Nyi Roro Kidul experienced despair because of this. Nyi Roro Kidul decided to commit suicide by plunging into the south coast which is now known as "Pelabuhan Ratu". 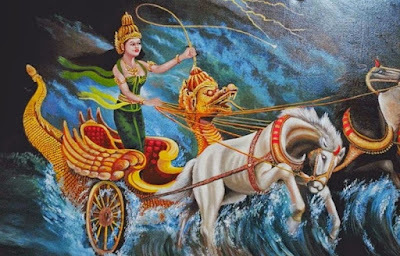 It is said that after plunging into the sea, Nyi Roro Kidul turned into a beautiful princess and became the master of the south coast and became a myth and legend till this day. Stories and myths about Nyi Roro Kidul also developed widely in the Central Java community, especially in the Parang Tritis area of ​​Yogyakarta, where the story states that the Parang Tritis area was a meeting place of Sultan Agung who was an Islamic Mataram King. In the myth also tells that King Sultan Agung often met with Nyi Roro Kidul in the southern coast of Jogjakarta. Some versions mention that Nyi Roro Kidul, by King Sultan Agung was appointed as a concubine to strengthen the rule of King Sultan Agung by combining the kingdom of Mataram in the real world and the invisible kingdom in the southern sea. Based on some paranormal opinions, the southern sea is a ghost kingdom and led by Nyi Roro Kidul. Not only in the Parang Tritis area which was used as a meeting place between the two "leaders", but there was also a meeting place in the Dlepih Tirtomoyo Wonogiri area, where local people often called it Kahyangan. The area has a very beautiful view, a river with very large rocks and small water. It is said that the place is a date place of Sultan Agung and Nyi Roro Kidul. These stories and myths have developed till this day and become part of culture. Some sceptic people say that these myths were purposely created to strengthen the legitimacy of ancient kings.